For those who love history or are enthralled with the tragic sinking of the Titanic, you may know that this April 2012 marks the one hundred year anniversary of the event. There are all sorts of events planned across the United States, and a quick Google search will turn up quite a few. The Grand Hotel is offering a three-day event package which looks wonderful. Locally in the San Francisco Bay area – Gaskell’s Dance Society will be hosting a Titanic themed dance in April. If you are looking for Facebook groups The Unsinkables, is one sharing information and news about costuming and events, and you can find an ongoing series of articles about 1912 fashions written by yours truly at Your Wardrobe Unlock’d. The Edwardian period has always been one of my favorites in the terms of its elegant simplicity, and lovely lines. Inspired by the anniversary and my own love of the period I thought it was about time to embark upon a project that I’ve been wanting to do for quite awhile. The 1912 Project needs your help! Through out the next few months, leading up to the Titanic Anniversary I will be transcribing patterns, graphics and information from the 1912 editions of La Mode Illustree – a beautiful French fashion journal of the period – with the goal of making all of the patterns from the entire year available. If you love to sew, and are intrigued by the 1912 era – you can help! The Library is looking for test sewers willing to post to the blog their experiences and photos in working with these vintage patterns. If you already have a blog, all you need to do is post there and send us a cross link to the entry. 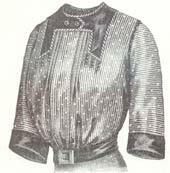 In return we will send you copies of the patterns to sew from as they are transcribed from the journals!